I just spent two of the most amazing months traveling with friends and family around China and Southeast Asia. I’m slowly coming to terms with the fact that my vacation is over, and can’t wait to update all of my loyal readers about my travels (to Harbin, Yabuli, Chengdu, Jiuzhaigou, Songpan, Bangkok, Chiang Mai, Luang Prabang, Vang Vieng, and Vientiane– whew, I hope I didn’t forget anything). Being back in Dalian has already had its shares of ups and downs, but overall, I can definitely say that I’m glad to be back. It’s nice to feel at home around my neighborhood, saying hello to the familiar faces that I’ve missed. The old couple that lives in the building next door was out for a walk yesterday and grinned ear to ear when I stopped to chat with them (despite the fact that I can barely understand the husband’s extreme Northeastern accent, and the wife had a stroke so she can’t talk much). Margaret and I returned to our favorite bing man for our usual order. I waved to the garbage man on my way home from class. Tomorrow I plan to buy some oranges from my favorite fruit vendor, and hopefully my go-to baozi seller will open up shop again soon. The weather has been in the 40s, which is so much better than what I was expecting when I left Bangkok’s humid 90 degrees. Maybe Spring really is on its way! However, when I wore shorts to work out at the gym near my house yesterday I was reminded that I am still a foreigner that is out of place here. Two old man camped out in front of the window facing my treadmill and stared at me (unashamedly) for several minutes, probably wondering a) what is this crazy foreigner doing here and b) why is she wearing shorts when it is 40 degrees out. I still hear a lot of Chinese that I don’t understand, but It’s been nice to be able to communicate with taxi drivers, store clerks and restaurant staff. I’ve missed being able to express myself in the local language! So to tide you over until later updates (with lots of pictures!!) 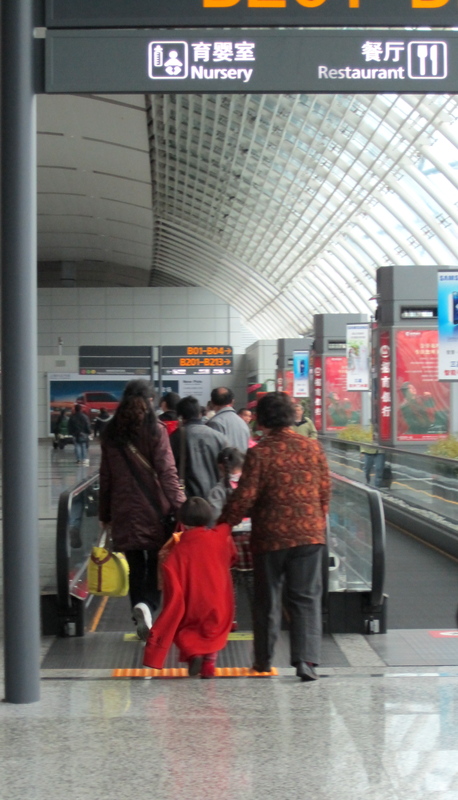 here is a precious picture that I snapped in the Guangzhou Airport of a little girl and her grandmother. Soooooooooo glad to have you back. Missed reading of your daily adventures and looking forward to catching up with your travels. So glad you had a good time and I’m sure learning and seeing so much. I have the same thought as Doris–I have missed your postings. You know I live and travel vicariously through you. Keep them coming. Hi Aunt Sherry, Aunt Jane and Grandmom, Thanks for the comments. I’ve been meaning to blog about so many things, but keep putting it off because I don’t have my pictures organized yet. I think I’ll just blog about my daily life for the next few posts until I’m ready to write some detailed posts about all of my travels.